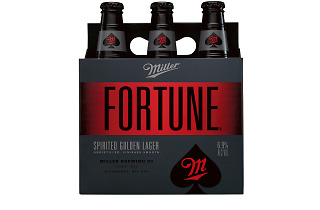 Photograph: MillerCoors Miller Fortune is a new macrobrew geared toward bourbon drinkers. If a new macrobrew is released without a Super Bowl commercial, did it really happen? The under-the-radar rollout of Miller Fortune may help answer that question. 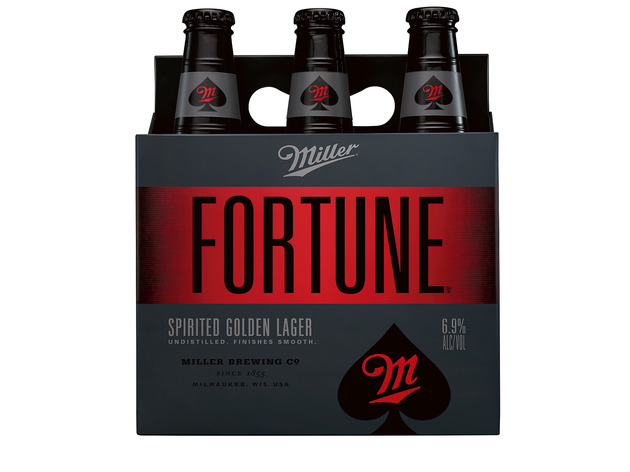 Miller Fortune is the first major new beer brand since SABMiller and Molson Coors merged in 2008. Since its headquarters is in Chicago and Miller is so strongly associated with Milwaukee, we decided to cover the beer in this otherwise-Midwestern-craft-focused column. Bloomberg did them no favors when it ignited the beer world by describing it (in the headline, no less) as a "bourbon-like lager," which couldn't be further from the truth in terms of taste. Businessweek reposted nearly the same story three days later with a different headline, but the damage was done. To find the real purpose of Miller Fortune, one needs to just look at the company's blog, which calls it "a beer that embodies the image of whiskey brands but drinks like a golden lager." It wants the whiskey drinker's wallet, and so is making a beverage with the image of a whiskey. One might think of the lessons learned by Jack Daniels when it moved into canning its own Jack & Cokes (sorry, cola beverages) or bottling its Lynchburg Lemonades—have you seen those on shelves lately? Exec: "We're losing market share to liquor. Let's make a beer that we can sell like bourbon, make it a little stronger, and make the bottle black, and let's put an ace of spades on it, too." Other exec, dubious: "What should it taste like?" Exec: "Dammit, man, do I have to have all the answers here? Who cares what it tastes like! Just go make the media buy!" I should note that my first beer was a can of MGD. My second beer was probably a Miller Red. I adhere to the principle that one should, at times, live the High Life. As such, I am more than open to the possibility of enjoying a Miller product. If there's an open mind going into drinking these beers, I like to think I have it. And no lie, it is a beautiful-looking beer: It's a perfectly clarified copper/amber color with a little touch of carbonation, and just a bit of whitish-yellow head retention that quickly disappears to make a beer that looks like...you guessed it. The bottle looks cool, too. If I were more cynical, I'd say this was a beer brewed to look great in TV commercials. It's also heavier in body than I would have expected—not weighty, not syrupy, but more present than any other current Miller beer I can think of. It also lacks that sort of slick feeling that beers like High Life can have. I'm guessing the added caramel malts help contribute to the near 7% ABV, as well as the deeper color. After that, this beer is sparkly and sweet. Strike bourbon, insert apple juice—it's bright and almost cider-like in its sweetness. There's just enough grain, malt and slightly off flavors of corn to remind you that this is a beer, and there's enough alcohol to feel a burn as you drink it. As beers go, is it a bad one? In deference to the craftsmanship, many microbrewers would love to be able to make a lager as dialed in and exact as any Miller product. Fortune is also thoroughly drinkable, and fairly refreshing, though that could be slightly dangerous for someone used to drinking Lite to get hit with nearly double the alcohol content. It's too bad, because there's the core of a good beer here. A little more flavor and backbone to the body from the malts, any follow-through on the Cascade hops that it promised, and maybe you've got something. Otherwise, there isn't a ton here—like jazz, this is a beer notable for the notes it didn't play. One of the more discussed parts of this rollout is the suggestion that people drink this like liquor, poured into a rocks glass. For scientific purposes, I drank one from a pint glass and one from a rocks glass. I didn't discern a difference in taste, nor can I report feeling any more awesome after drinking from the rocks glass (though I was only drinking in the company of my cat, Badger). Through experimentation, I have concluded that the idea of drinking this beer from a rocks glass is the goofiest idea from a major beverage company since the other guys suggested we drink their beer out of bow-tie–shaped cans—and this is coming from a guy who on occasion drinks from a plastic horn.